The techno world just keeps on spinning. It seems almost a daily occurrence in which I am introduced to a new technology. One of the shifts in technology that I have been recently introduced is to the format of the E-Magazine. This new type of magazine is downloaded to your computer. One of the coolest things about it is that it is a multimedia format, meaning that it includes both written text and video. Last August 2010, our Annapurna sock yarn was featured in Interweave Press's first E-mag, Sockupied. 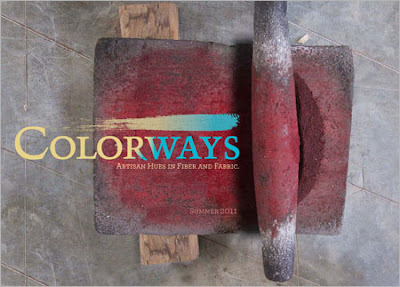 This month, Interweave released a new E-Mag dedicated to natural dyeing, Colorways. They asked me if I would be interested in an article about Verb and natural dyeing. Can you guess my response? It went something like this "Are you kidding? I would die! Yes!" And, then, after sending the acceptance email to Anne, my second thought was "Holy crap! What I have agreed to? Video? Me on video...? Oh dear God, please do not let me say anything totally embarrassing! Or sound too much like a valley girl. Please allow me say something interesting." 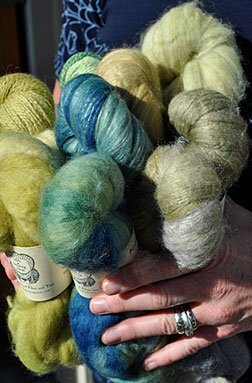 Anne Merrow, the editor of Colorways, came to the shop last January. Though I was nervous, Anne was so nice. She made it easy to talk to her. To be honest, I wasn't really sure what Anne was creating in terms of the project on the whole. So, when I received my copy of Colorways, I was floored! Not only did Anne write a great article on Verb, the other articles in Colorways are spectacular. Between the photographs, the text, and the videos, you will travel from Oakland to Oaxaca to Mali. While reading through Colorways, it dawned on me. When natural dyeing, I feel like I am traveling to different parts of the world because I partake in a task that others from around the world are also doing. I love that Colorways creates and extends this feeling to the reader. I am extremely grateful to Anne for creating Colorways, for giving the fiber community this resource, and am so thankful to Anne and the folks at Interweave for including Verb. To download Colorways for Mac, click here. To download Colorways for PC, click here. If you are going to Sock Summit, and have not already signed-up for my class, there are still a few spots available in my 3 hour, Global Color class. I've been working hard on my presentation and can not wait to share natural dyeing's wealth of color with you. "colorways" is really great! It's super to buy this online and after about 20 minutes download you can find so much information! Your blog looks really nice too! Do you send newsletters? congrats! Nice work! Can't wait to see you at Sock Summit! !